EPIC is a scalable middleware EDI solution with which messages (such as orders, invoices and packing slips) can be sent and received globally in a quick and safe manner. EPIC is suitable for mid-sized and large businesses, and is widely used by multinationals. EPIC’s software guarantees that you will be able to exchange an unlimited number of EDI messages error-free and safely with your business partners worldwide. It supports various message standards (such as ODETTE, VDA, EDIFACT, ANSI and EAN) and communication protocols (such as FTP(2), AS2, OFTP and X.25). EPIC automatically converts messages into the standard you use, so that your ERP system can open and process the messages. With EPIC, you will be able to separate your business processes and manage them more effectively. As a result, EPIC is extremely well-suited for businesses with several branches at multiple locations that send EDI messages. EPIC allows customization. As a result, the software’s capacity automatically increases as the use and/or number of users of the product increases. EPIC allows you to adapt automatically. EPIC also ensures that high-priority tasks take precedence. EPIC has a Business Activity Monitoring (BAM) dashboard. This allows you to monitor your data traffic. Moreover, EPIC has its own security measures, so it can defend itself against external attacks by, for instance, viruses. During integration, the EDI software is placed into an ERP environment. This can be done in Oracle and SAP, among others. However, integration can also be carried out with other ERP environments. 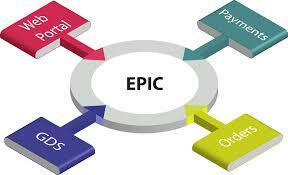 Would you like to know more about EPIC, our Enterprise Middleware Solution? Our EDI experts are happy to help.